Even though the leaves are changing colour, that doesn’t mean camping season is over. One of the best things about the RV lifestyle is that these fancy mobile campers are equipped for all sorts of weather’some are even winter ready! Transition from summer to our colourful fall while exploring all that wild Canada in autumn has to offer. Like most other vacations, the ‘off season’ is a great time to travel at lower rates. So not only does fall camping offer you and your family crisp autumn views, but these views come attached to a lower price tag. Bigger companies like CanaDream, Fraserway RV, and Cruise Canada sometimes offer seasonally lower prices, and have pick-up locations scattered across Canada’s major cities. Looking for a specific rig’ Go RVing can help you track down lesser known RV rental services to fit your fall needs with our RV rental locator. Most RV rentals come fully stocked with bedding, kitchenware, and necessary accessories. All you need to do is bundle up the kids and hit the road. Maybe pack a few more layers than you would for a mid-summer road trip. However, before you choose an RV rental service, you should choose your destination (and your departing location). If an autumn adventure full of sunny afternoons, quiet evenings around a campfire, and just-cool-enough nights sounds like your kind of fun, check out these Canadian fall camping destinations. With summer’s end, the days grow shorter. But nighttime fall-centric activities can be just as rewarding as a mid-summer’s canoe around the lake. The Northern Lights, for one, come out to play when darkness sets earlier each evening. Most Canadians know that Alberta is a hotspot for these natural light shows. If you’re located somewhere between Calgary and Edmonton, the Rocky Mountains should be your go-to destination for fall camping. Jasper National Park, specifically, is a fall mountain destination that also happens to be one of the world’s largest Dark Sky Preserves. The dulled city lights make for fabulous aurora borealis shows. The town of Jasper even hosts the Dark Sky Festival annually to celebrate and stargaze between the mountain peaks. While bear season is in full force throughout the fall, hard-shelled RV camping is still a go at most of Jasper’s campgrounds. If you’re looking for a fall RVing adventure that reminds you of summer, Vancouver Island is the place to find exactly that. Head north on Vancouver Island to stay at one of Tofino’s plentiful campsites. Tofino is nestled in Canada’s notorious Pacific Rim National Park. Some of the campgrounds’we like Green Point’are actually Long Beach-side and pull-through to fit large RVs. The drive is just short enough to depart from Vancouver, but it’s easier to pick up your rental on the island before hitting the road. Fall on the West Coast feels more like summer because ocean surfers are still in full force. Wet suit surfing and whale watching along the coast are a few of the fall activities specific to Tofino and area. For the best land-based whale watching, travel 20 minutes south of Green Point Campground to the town of Ucluelet. Ucluelet is home to the old Amphitrite Lighthouse, which is an ideal shoreline viewing point. Sure, we’ve all got a friend with a lakeside cabin in the Muskoka’s, but have you thought about exploring Canada’s lake country via rental RV’ Few people realize how many privately owned campgrounds rest lakeside’some even directly beside their usual watering holes. Most campgrounds are open until October 31, and many are open as late as December. 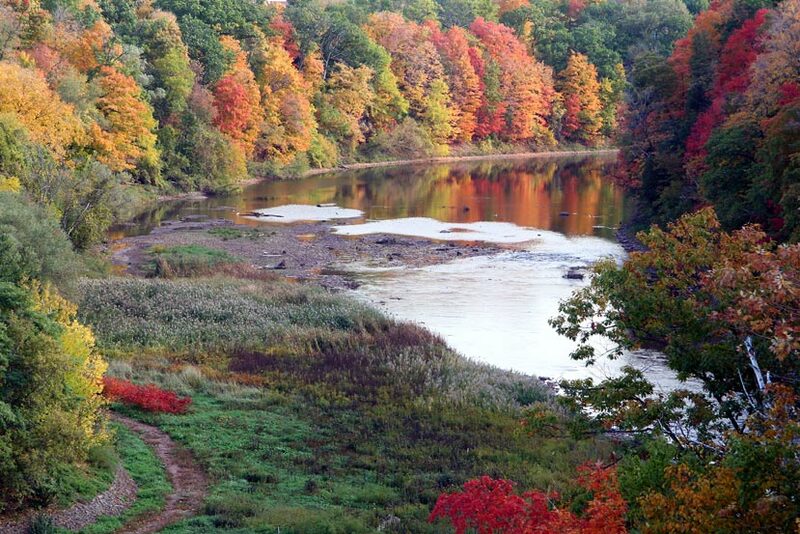 Fall camping is literally at your fingertips if you’re from Southwestern Ontario. Pack up the family for a trip to the Muskoka’s without asking your friends to borrow their cottage. Depart from a big city, like Toronto or Barrie, to check out small towns like Bracebridge, Gravenhurst, and Bala. We promise a fall camping experience different than Ontario residents’ go-to Algonquin Park. These lesser-travelled destinations are perfect for quiet morning canoe trips, or bike rides through Ontario’s fall forests. The small Muskoka towns themselves provide quaint afternoon outings. Cape Breton holds the hearts of many Canadians, but have you visited in the fall’ The space where the mountains meet the sea to form river canyons, cliffs, and beautiful coastline is spotted with thick forests that are currently changing colour under the autumn sun. Pick up your rental in Quebec for a full-fledged East Coast adventure’about 14 hours from Montreal to The Cape’or fly into a rental spot in Nova Scotia to spend your whole vacation enjoying the easygoing Maritime life. The Cabot Trail, which meanders through the northern point of Highlands National Park, is a fall fan favourite. We like Broad Cove Campground for a coastline camping experience; choose Cheticamp Campground to explore the Cheticamp River Valley of the National Park. Both campgrounds have RV accessible sites, and are open until October 31. Quebec’s Eastern Townships offer quaint small-town living in the foothills of the Appalachian Mountains. The best part’ Most of the campgrounds in this area offer fall discounts for those of you planning your autumn adventure. Quebec City and Montreal are the obvious departing locations to tour the Eastern Townships via rental RV, but the area is close enough to Ontario to take off from Ottawa as well. Mount Brome and Mount Sutton are local favourite rolling mountain hikes with beautiful fall views that flow forever along the valleys. When we say the views go forever, we mean it. We swear, you can almost see the United States from these two peaks! The hikes themselves are fairly user-friendly. Some trails pass by small rivers and ponds flooded with wildlife.